“1. 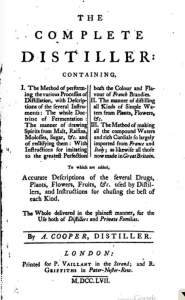 The method of performing the various processes of distillation with description of several instruments: The whole doctrine of fermentation; The manner of drawing spirits from malt, raisins, molasses, sugar, etc. and of rectifying them; With instructions for imitating to the greatest perfection both colour and flavour of French brandies. “2. The manner of distilling all kinds of simple waters from plants, flower, etc.